waverp – An Arduino Library for recording and playing wave files on the Adafruit Wave Shield « Adafruit Industries – Makers, hackers, artists, designers and engineers! Nice! 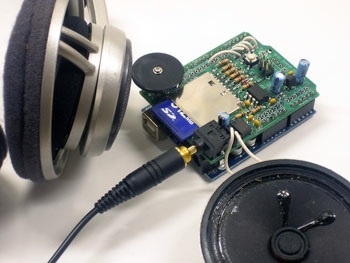 waverp – An Arduino Library for recording and playing wave files on the Adafruit Wave Shield. WaveRP is an Arduino library for recording and playing Wave files with the Adafruit Wave Shield. It records 8-bit mono files at 4,000 to 44,100 samples per second. 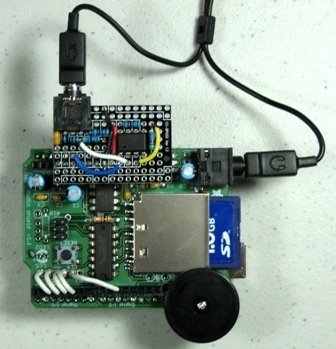 Use of the Wave record/play library, WaveRP, requires the following: Arduino with a 5 volt 328 processor. Low noise power source such as a nine volt DC adapter or battery. Adafruit Wave Shield (version 1.1 is best but 1.0 works) Microphone preamp. A circuit for a simple preamp is included in the documentation. Microphone, PC type with 3.5 mm plug. See the documentation for details. SD/SDHC formatted with 32KB allocation units. This shield is a kit, and comes with all parts you need to build it. Arduino, SD card, tools, speaker and headphones are not included. It is fairly easy to construct andanyone with a successful soldering project under their belt should be able to build it. Please note that the library rather bulky, requiring 10K of flash and more than 1/2 K of RAM for buffering audio. It works fine using an ATmega168-based Arduino (or compatible) but for more complex projects I strongly recommend upgrading to an ATmega328! The new WaveRP library is great. But is the playback still limited to 22KHz, 16-bit, mono ? Even if I can record @ 44.1KHz, 8-bit. What is the maximum output quality I can get? it’s not clear what’s included in the kit from your online store. can it be used with an external dac chip? can i tap i2s (or some dac format data) from the controller? Wondering if it is possible to transfer the audio files stored on the SD card into a connected PC via USB.